Outdoor basketball courts and indoor basketball courts from Southwest Greens are all diagrammed and built to regulation size dimensions. Enjoy home hoops on our backyard basketball courts featuring state-of-the-art modular flooring. Our athletic flooring is featured on all of our multi-game courts and is built for durability and a reduction in body stress. Expedite your installation and construction by consulting with our design experts, and build a court designed for hours of fun with family and friends. When you purchase commercial and backyard basketball courts from us, you’ll enjoy the game on a court worthy of the game’s finest players. Add one of our commercial or residential regulation basketball courts to your home or business today. Try our backyard basketball courts and see what you’ve been missing! Southwest Greens’ outdoor basketball courts and indoor courts allow you to take the game home with you. Each court features our modular surfacing for the finest in traction and performance, and each court is diagrammed to include regulation basketball dimensions. 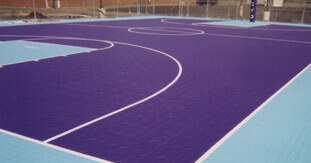 Southwest Greens’ outdoor basketball courts and indoor basketball courts are built to regulation basketball dimensions. The more you learn about our backyard basketball courts the more you’ll want one of your own!